Yesterday this fantastic review by Kim Kindermann of the German edition of Cruelty Bites published this month by Moritz Verlag (Grausame Welt?) was aired on German public radio Deutschlandfunk Kultur. Here is a translation of the review. Long live Grausame Welt?! 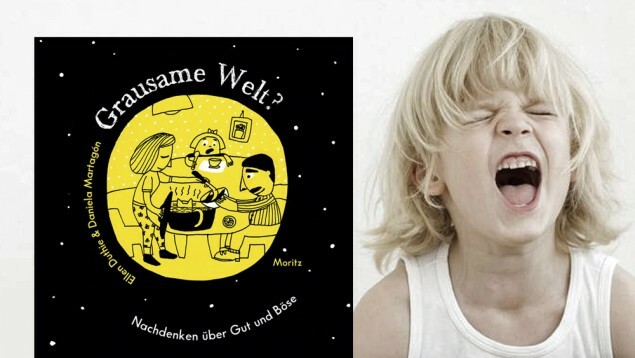 Cruel situations and scenes, described and illustrated by two authors: Cruelty Bites invites children to think about good and evil. A very successful book about a very difficult subject, in our reviewer’s opinion. "Let’s try pinching very hard. Any reaction?” says the card, showing a boy tied down to a table. The scientists experimenting on the child are rats. On another card, a man has been locked up in a cellar by a group of children. "Now you stay down here and think very carefully about what you’ve just done!" they say. And on another card, a girl is biting her own arm. Three scenes, three cards. Three of a total of 20. All of them are square. On one side, we see a cruel situation: a girl kills an ant, some lions eat a goat, a mother and father serve a stew made with cat meat, some children pull a girl’s hair, a father holds down his son firmly to give him a shower. On the back of each card, lots of questions on the theme. Off with the rose-tinted glasses! Philosopher Ellen Duthie doesn’t actually offer any answers as to what cruelty is. She asks where cruelty starts, what about the victims, what about the perpretrators, and whether an act might be less serious if it doesn’t last too long. Step by step we are invited to analyse the situation. The focus is always on the questions. What do you find cruel about it? Have you ever experienced a similar situation? It is demanding. Ellen Duthie does not only ask children to deal with this difficult problem; she also tells them cruelty exists. So off with the rose-tinted glasses"! The world isn’t all pretty. But should we ask children questions? Yes, we should! Because children live in this world, with all its shadows too; children see and also experience situations that are not easy. The sooner they learn to classify situations, to give them a name and understand their own feelings, the sooner they might try to avoid being cruel. Here, that happens because they are allowed to experience different situations playfully. But also because these cards invite readers to comment. Unlike your typical read-aloud book for children, here exchange and reasoning occurs. That is good. The format also contributes to this. The cards allow several children at the same time to engage in dialogue about different aspects of cruelty and to reason with each other. Duthie manages to make you want to speak about a subject that many would rather avoid altogether. Daniela Martagón’s illustrations are also a great success in this regard. On the one hand, they are simple, in black and white on a colour background, and reminiscent of cartoons. On the other hand, they play with the absurd as a mechanism of distance. Like the rats, that keep the children in cages as test subjects. Or the girl who bites herself, and whose enormous sharp teeth seem to belong more in the mouth of the cat that is standing opposite her, with its hair standing on end. There’s nothing pretty or cute about the illustrations, which clearly hone in on the cruelty of the content. This is stressed further by the bright background colours: pink, orange, blue, green and yellow. They act like a flag: Attention! This is important! And yes, this book of cards is important. Let’s state it clearly: children ought to be taken seriously. We can and should speak about subjects such as cruelty with them, philosophise with them. What is more, we can start early on, with no rush: Cruelty Bites is perfect for preschoolers and primary age children. What is ok and what is not? Where are the limits and to what extent can they shift? It is never to early to start talking about all of this. You've got a letter! 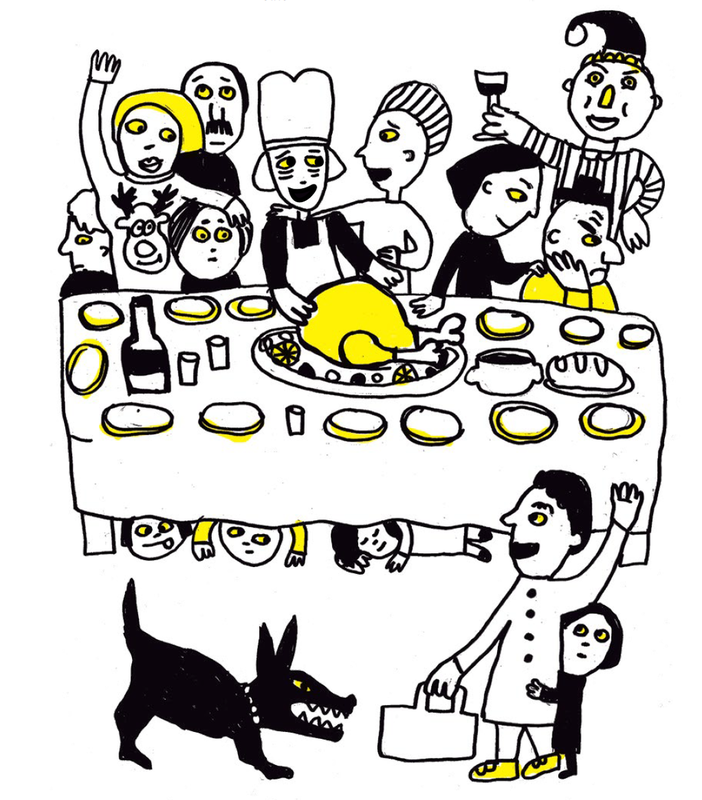 And it's from Tomi Ungerer! Last Friday larger than life author illustrator Tomi Ungerer died. For the Wonder Ponder team, Ungerer was many things. First, as readers, he was the author of some of our favourite children books: No Kiss for Mother, The Three Robbers, Zeralda’s Ogre, Flix, Crictor, Moon Man, The Beast of Monsieur Racine… to name just a few. 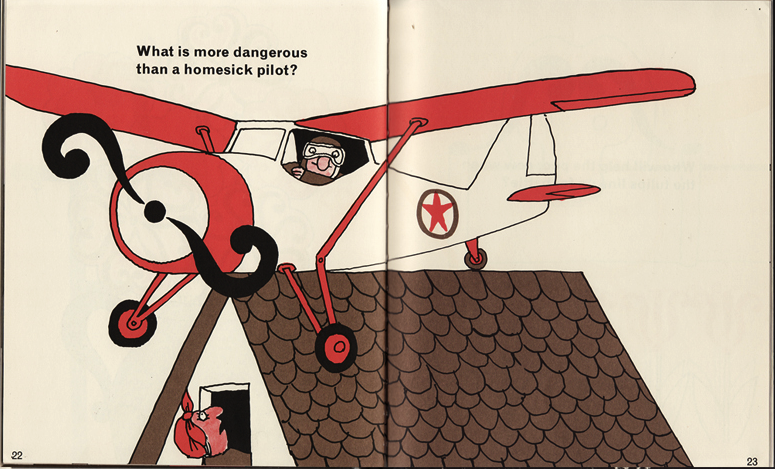 On the other hand, Ungerer, like us, had a rather special relationship with questions. We were big fans of his illustrated answers to children’s philosophical questions for Philosophie Magazine, which were collected in a book and published last year: Ni oui ni non. 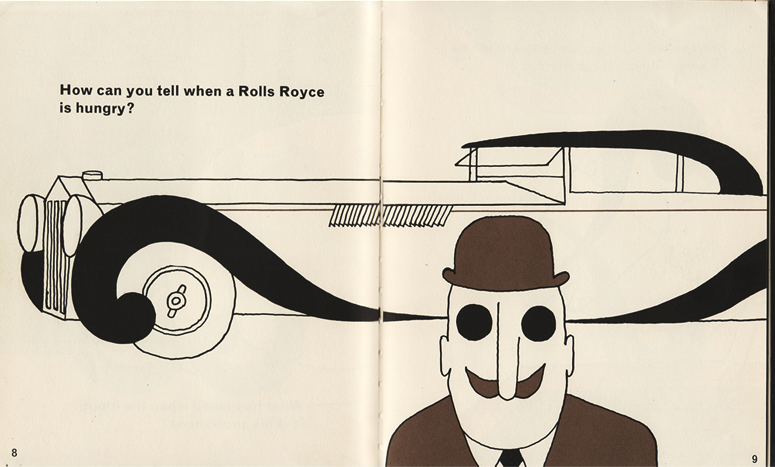 As authors, Ungerer is always a graphic reference and a model of boldness to bear in mind. Readers who look carefully will find more than one hidden or not so hidden tribute to him in our books. In the poster included in our Cruelty Bites box, readers will find our beloved Piper Paw from No Kiss for Mother. Tomi Ungerer’s Piper Paw uses his slingshot on Daniela Martagón’s Piper Paw. ﻿In the poster included in our Whatever You Want box, featuring that splendid FREE HOUSE, it is not difficult to spot who presides it, with all their treasure hoarded up in the attic. 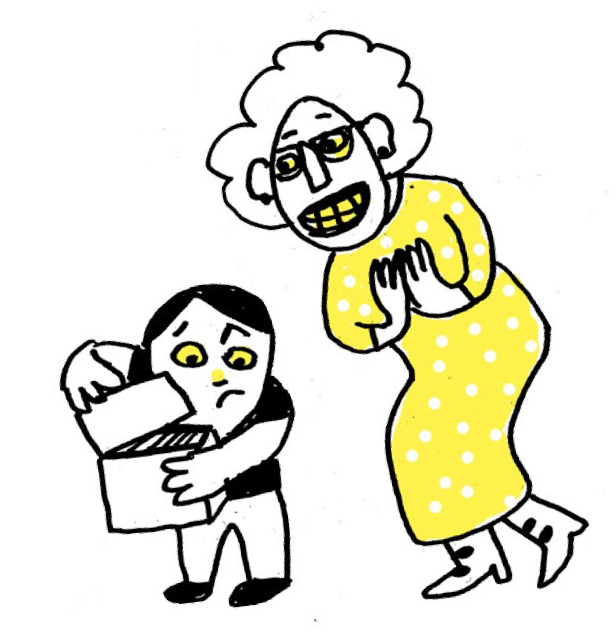 But we have a story involving Tomi Ungerer, and we think it explains exactly how we feel. One day about three years ago we thought of sending Ungerer our books and we contacted his daughter Aria via his Twitter account. She very kindly gave us her address for us to send them on. At the time we had only published two titled, Cruelty Bites and I, Person, and we sent him both, signed and drawn, with a letter inviting him to spot some of the hidden surprises we had included for him. And the following day, another message: “He loved it!” (attaching this picture)”. Did we shriek? Maybe. We were excited and very touched with his generosity. 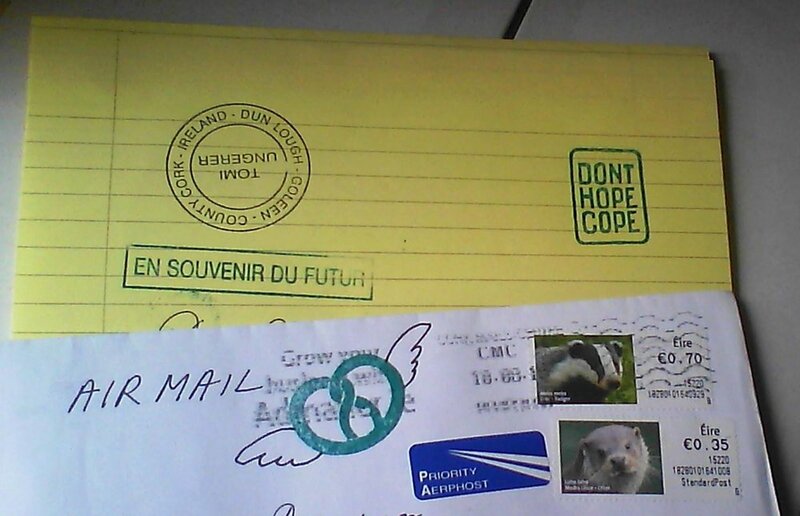 We thought we couldn’t feel any more chuffed when a few days later, we received a hand writtten letter from Tomi Ungerer, spotted with stamped mottoes: “Expect the unexpected”, “Don’t hope, cope”.” En souvenir du futur… “ In the letter itself, he says several things, but mainly two: that there should be copies of the Wonder Ponder boxes at every school and that he hoped we would continue with the project. The letter Tomi Ungerer sent us after we sent him Cruelty Bites and I, Person. It may seem silly and of course it did not change our lives. But it is not every day that an author you admire shows such generosity with time and words. It is VERY encouraging. Thank you very much for the encouragement, Tomi. And thank you even more for your books. And we leave you with a not so well known book of Tomi Ungerer’s with wonderfully absurd and fun questions. Is it fair for those who behave badly not to get any presents? Who decides who has behaved and who hasn’t? 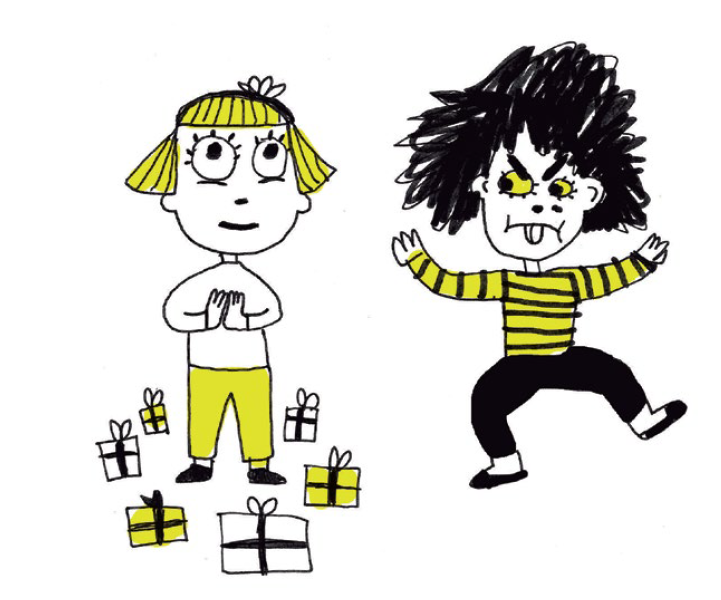 Do you know anyone who didn’t behave well and didn’t get anything for Christmas as a result? What is it to behave well? What is it to behave badly? Can we sometimes be good for bad reasons? Christmas is around the corner and at Wonder Ponder we think it is a great chance for wonderpondering. Since we first launched our Christmas Wonderpondering booklet a few years ago, we've had the chance to see for ourselves that many teachers and families also thought so, judging by all the messages we got describing what a great time they had had and how much they had wonderpondered about Christmas with our special downloadable Christmas wonderpondering booklet. So this year, here it is again, our Christmas gift for everyone to share: a free, downloadable and printable PDF booklet chock-a-block with ideas for wonderpondering about Christmas. Enjoy! The Wonder Ponder Christmas Special is a free, downloadable, printable and shareable booklet for thinking and drawing about Christmas, including questions about presents, traditions and customs, family obligations, celebrations, behaving and misbehaving, a suggestion for designing a summer outfit for Santa for the sections of his journey where it's not winter, and much more! Download, print and share it. Available in English, Spanish and Catalan. Check out other free Wonder Ponder resources here. DO YOU KNOW ABOUT THE WONDER PONDER SERIES OF VISUAL PHILOSOPHY FOR CHILDREN? Wonder Ponder's Visual Philosophy for Children series introduces readers aged six and over to philosophy's big questions playfully and appealingly. Engaging scenes and intriguing questions prompt reflection and discussion encouraging children to develop their own thoughts and arguments and to build a visual and conceptual map of the issue addressed in each box. Wonder Ponder boxes are designed to look at, read and think about by themselves or with others, in educational, play or family settings. Choose from one of our three titles so far, Cruelty Bites, I, Person, Whatever You Want and Pinch Me! or take all four of them! Check out the catalogue or visit our shop. Thank you for your interest in Wonder Ponder's Visual Philosophy for Children! Did you know World Philosophy Day is also known as World Wonderpondering Day? At Wonder Ponder we have decided to celebrate World Philosophy Day by making you all think mercilessly, non-stop. 1. With a fantabulous, free, downloadable thinking sheet for fun and games with your brain. 2. A hypnotising short film, Little Remo in Pinchmeland, based on the comic from the poster included in our latest Visual Philosophy for Children title Pinch Me! And we have thrown in a sheet with questions to get started! 3. With a free, downloadable poster as celebratory decoration. First things first. We have prepared a special downloadable thinking sheet. If you print it on one page on both sides and fold it down the middle, you'll have a nice wee 'booklet' to hand out in class, read and chat about at home and think of any good questions of your own. For an extra slick look, try printing it on coloured paper (we love the way it looks on bright orange, yellow, green, red and blue). Would you like us to let you know when other Wonder Ponder material is available? Second? A short film! 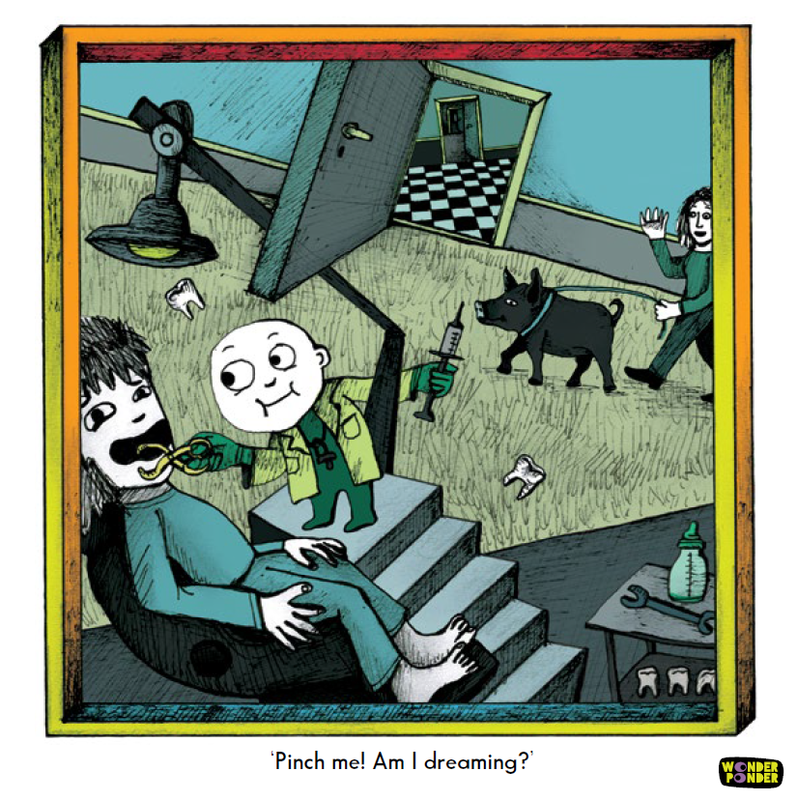 Little Remo in Pinchmeland is based on the comic with the same title included in the poster in Pinch Me!, the latest in Wonder Ponder’s Visual Philosophy for Children series. Our suggestion is you watch it, with someone if possible (at home or at school) and then have a good old wonderponder about all the questions it raises. To kick you off, we have prepared another downloadable sheet for questioning, thinking and engaging in thrilling dialogue. For Wonder Ponder, World Philosophy Day not only celebrates philosophy, it also marks the third anniversary of the launch of our first title Cruelty Bites in Spain, in November 2014. Today, it has been published in South Korea, Argentina, Mexico and Brasil and it will soon be coming out in Germany All our titles are published in Spain, in three languages (Spanish, English and Catalan). So we have rather a lot to celebrate! And that's where our free, downloadable World Philosophy Day thinking poster comes in. Enjoy! Today we are launching our first animated short, based on the comic Little Remo in Pinchmeland, included in Pinch Me!, the fourth title in the Wonder Ponder Visual Philosophy for Children series. We are making it freely available to anyone out there wishing to watch it at home, in the classroom or to screen it wherever they want. 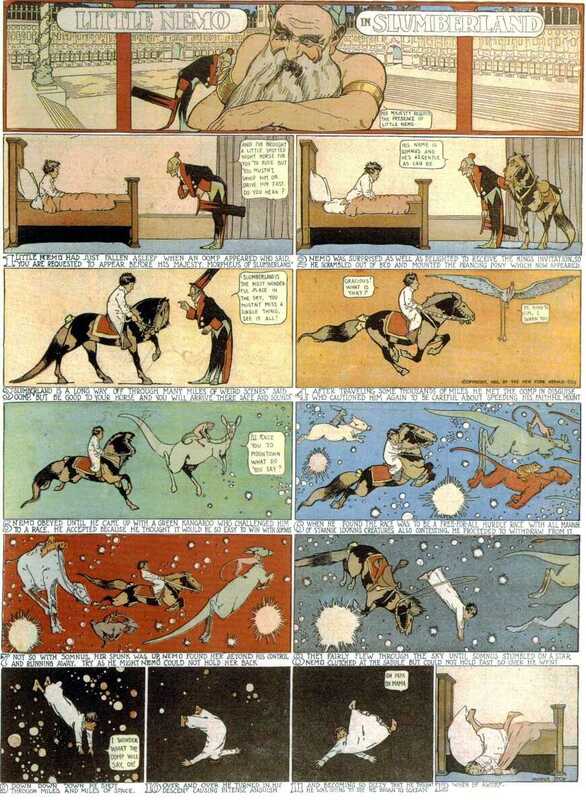 We are launching it today, October 15, to coincide with the publication date of the first Little Nemo in Slumberland comic strip by Winsor McCay, which our character Little Remo is an obvious referece to. Maurice Sendak fans will also detect a tribute in more than one sense to te author of Where the Wild Things Are, Outside Over There and In the Night Kitchen, which brings us back in a neat loop to Sendak’s own homage to Little Nemo. Sendak’s very own Little Nemo, Mickey, falling through the night, out of his clothes. In the Night Kitchen. Harper, 1970. There are many other references and influcences besides these. We are sure you’ll have fun spotting them! A big clue is found in the books on the shelf in the scene in the bedroom at the end. But besides the references, this short film is meant to hyptnotise, delight, baffle and bring some uneasy shifting in your seat together with some intriguing questions. Haven’t you ever woken from a dream, only to realise that you are still dreaming? Can we be certain that life is not actually a dream? And many, many more. The piece was produced by La Pierna Audiovisual. It was a pleasure working with them to put Little Remo into motion. This is a short film we have financed with our own limited resources with our sights set on potential funding for future projects. In order to get funding for future audiovisual projects, your ‘likes’ mean a great deal, as do your shares. That is why we are offering all our readers and followers this film for free, as we do regularly with other material, such as the special booklet for thinking about school or the booklet for wonderpondering about Christmas. We only have one request in return: if you like it, ‘like’ it; and if you really like it, please do share it. Thank you and we hope you enjoy! At Wonder Ponder we love thinking about all sorts of things. School and learning is one of our favourite things to think about and we often do so with children. We always have lots of fun and come up with excellent ideas for improving things about our own schools and our own learning. But we couldn’t have you all missing out on the fun! So we’ve decided to publish a free, downloadable, printable and shareable booklet chock a block with ideas for thinking about school! Ten pages, (ten!) full of questions and ideas for thinking about school aimed mainly at primary school age children, and teachers too! An invitation to think about learning, about what makes a good teacher and a good student, about the perfect playground, the perfect classroom, the school of our dreams and the school of our nightmares. An “Interview your teacher” activity, ideas for writing a story or an essay or drawing something inspired by your thinking, and several real dilemmas we might encounter at school. We also include a page for readers to add their own questions and drawings. But you can add as many pages as you like. Yes! This is a booklet with room for growth! Wonder Ponder. What do you think? Click on the image or here to download. Pinch Me! [together with its versions in Spanish (¡Pellízcame!) and Catalan Pessiga’m! ], the latest title in the Wonder Ponder series of Visual Philosophy for Children (and adults) has just arrived from the printers. In this fourth title in the series, authors Ellen Duthie (writer) and Daniela Martagón (illustrator) invite people of all ages, small, medium and big, to wonder and ponder about reality, imagination and dreaming in a way that is both playfully serious and seriously playful. What is real and what is not quite so real? Containing fourteen illustrated scenes designed to prompt wondering and pondering, Pinch Me! invites younger and older readers to explore a range of intriguing aspects about reality, imagination and dreaming, including the differences between real and pretend, real and alive, our senses and what they can (and can't) tell us about the world, and to wonder whether we could be dreaming or not. It also contains scenes that are likely to spark wondering and pondering about magic, virtual reality, fiction and reality, fake news and representation in selfies, in a way that is both relatable and destabilising, as well as riveting for a very broad age range, from age 6 to adults. As all Wonder Ponder fans out there know, every box contains a poster. This is normally a chance for illustrator Daniela Martagón to explore the theme of the box freely and sometimes wildly. This time both authors, writer and illustrator, have joined forces and gone wild, to create what is effectively a book within the book: Little Remo in Pinchmeland. 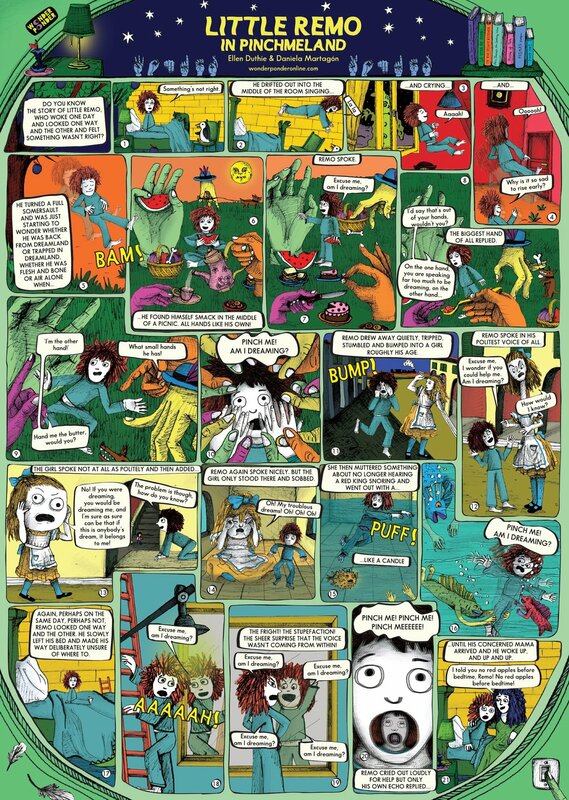 A tribute to Sendak's' In the Night Kitchen ,which was in turn a homage to Winsor McCay's Little Nemo in Slumberland comic strips, this read-aloud comic on a poster takes Little Remo through dreamlike scenarios made up of elements from the 14 scenes in Pinch Me! and other literary scenes, making readers wonder whether or not he's dreaming and, perhaps, whether they are themselves dreaming. After Cruelty Bites (2014), I, Person (2015) and Whatever You Want (2016), and the success of the Wonder Ponder Visual Philosophy for Children's project not only in Spain, where the books are published originally, but also , thanks to the sale of foreign rights, in South Korea, Argentina, Mexico, Brazil and Germany, we took some time to digest everything that had happened since the launch of the Wonder Ponder imprint in November 2014. We took the time to step back and make sure that we knew where we were and where we wanted to go. The pace of our project does not need to follow and would not benefit from following the pace of the publishing market. The research requires time, the creative process requires time, the testing with different age groups and ensuing reconsideration takes time. Slow publishing? That's us! We are working to create a lasting collection, one that reaches other countries and languages and one which several generations of children and adults might hopefully enjoy. At a time where most of the voices we hear boom out answers and statements about the ways things are and the way they should be, it is more urgent than ever to develop the habit of owning, sharing and exploring our uncertainties. That is part of what we aim to do, with both a literary and a philosophical interest at heart, in the Wonder Ponder series of Visual Philosophy for Children. That is what we have done, with equal measures of rigour and playfulness in Pinch Me! Readers outside Spain can purchase a copy online. What if life is a dream? Or a good old story? When you pinch yourself, does it hurt? And does the pain prove you are not dreaming? Can we trust our senses? If our eyes sometimes trick us, might they always trick us? How do we know that the world is as we perceive it and not as a fly or a dog sees it? If you could connect to a machine that made you live and feel only good things, would you want to connect to it forever? What is real? And what is not so real? Half-way between a book and a game, Pinch Me! comes in a box and invites readers aged eight and over (adults too!) to think about reality, imagination and dream in a way that is both serious and seriously fun. Part of the critically acclaimed Wonder Ponder, Visual Philosophy for Children series, Pinch Me! is designed for children to look at, read and think playfully about by themselves, accompanied by an adult or in a group, in educational, play or family contexts. Themes: reality · imagination · dream · memory · the five senses · perception · fiction/reality · real/pretend · reliable information · real/virtual · philosophy for children. · More than 100 carefully worded questions designed to spark a rich and well-oriented reflection without leading it to pre-established conclusions. · 3 blank cards for readers to design their own philosophical scenes and pose their own questions. · Brief guide for children and adults. · Ideas for wonderpondering. Suggestions for use. Wonder Ponder introduces readers to philosophy’s big questions in a way that is playful and appealing. Engaging scenes and intriguing questions prompt reflection and discussion, encouraging children to develop their own thoughts and arguments and to build a visual and conceptual map of the issue addressed in each box. Interested in learning more about the Visual Philosophy for Children series by Wonder Ponder? Check out our website and our online shop. Wonder Ponder's Visual Philosophy for Children title Whatever You Want (Lo que tú quieras) was awarded a Best Children's Books in 2018 Prize by Banco del Libro. The Spanish edition of the book published by Wonder Ponder in Spain and by Ediciones Iamiqué in Argentina, was selected as one of the top five best books of the year. Congratulations to our authors, Ellen Duthie and Daniela Martagón! Who is the freest person you know? If you were certain that nobody was ever going to find out, would you misbehave? Can we all do whatever we want at the same time? What do you think? Whatever You Want is the third title in the Visual Philosophy for Children series by Wonder Ponder. Half-way between a book and a game, it comes in a box and invites readers aged six and over (adults too!) to wonder and ponder about freedom in a playful and careful way. Find out about the other winners here (in Spanish). Find out more about the award-winning institution Banco del Libro here. Find out more about our upcoming title, Pinch Me! here. Pinch Me! , the new title in the Wonder Ponder Visual Philosophy for people of all ages coming out in May, will invite readers to explore reality. All of reality? As much of it as possible and from as many angles as possible! Coming soon, the new title in the Visual Philosopy for Children series by Wonder Ponder, Pinch Me! We are not quite ready to publish the cover, but Daniela Martagón's illustrations is a wee glimpse of what you might find inside the box. Woohoo! Can a made-up story be real? Are some witnesses more reliable than others? The box provides plenty of opportunities for younger and older readers to explore the differences between real and pretend, real and alive, our senses and what they tell us about the world, and to wonder whether we could be dreaming or not. It also contains scenes that are likely to spark wondering and pondering about virtual reality, fiction and reality, fake news and representation in selfies, in a way that is both relatable and destabilising, as well as riveting. Coming soon, the new title in the Visual Philosopy for Children series by Wonder Ponder, Pinch Me! We are not quite ready to publish the cover, but the above is a close-up of the title on the cover. Woohoo! 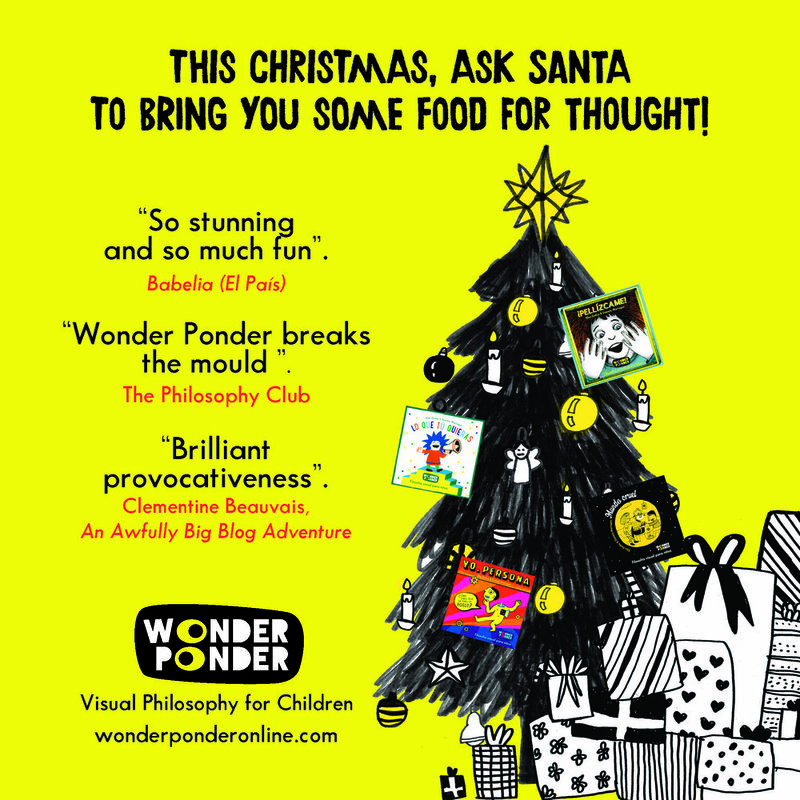 Christmas is around the corner and at Wonder Ponder we think it is a great chance for wonderpondering. In the last couple of years, we've had the chance to see for ourselves that many teachers and families also thought so, judging by all the messages we got describing what a great time they had had and how much they had wonderpondered about Christmas with our special downloadable Christmas wonderpondering booklet. Click on the image above to download full PDF file. WISHING YOU ALL A WONDERFUL, PONDERFUL, CHRISTMAS! Ready to celebrate World Philosophy Day with Wonder Ponder? Download our free Wonderpondering Sheet! Ready to celebrate World Philosophy Day? At Wonder Ponder we have decided to turn it into a full World Wonderpondering Week. And we are going to make you all think mercilessly, non-stop. 2. For those of you in México only: To celebrate the publication of the Mexican version of Cruelty Bites by publisher Sexto Piso, a book presentation at the Biblioteca Vasconcelos in Mexico City, plus a number of conferences and an eight hour workshop (check out details in Spanish here). First things first. We have prepared a special downloadable thinking sheet. If you print it on one page on both sides and fold it down the middle, you'll have a nice wee 'booklet' to hand out in class, read and chat about at home and think of any good questions of your own. For an extra slick look, try printing it on coloured paper. 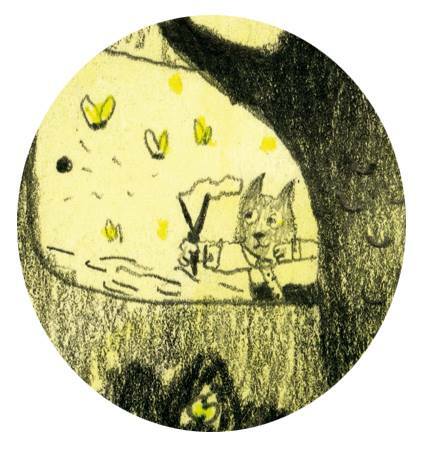 Second, (only for people in Mexico), on Wednesday 15th, we are taking part in the International Children's Literature Festival in Mexico City (FILIJ), with a conferencia on Visual Philosophy for Children in the morning and a book launch for the Mexican version of Cruelty Bites in the afternoon. On World Philosophy Day itself (16th of November), we'll be taking part in a round table on non-fiction books at the same fair, and starting our eight-hour workshop in the afternoon. On Friday the 17th, we'll be completing the workshop. For Wonder Ponder, World Philosophy Day not only celebrates philosophy, it also marks the third anniversary of the launch of our first title Cruelty Bites in Spain, in November 2014. Today, it has been published in South Korea, Argentina, Mexico and Brasil and rights have been sold to Germany. All our titles are published in Spain, in three languages (Spanish, English and Catalan). Wonder Ponder's Visual Philosophy for Children author Ellen Duthie will be taking part in the 18th International Conference of the Internacional Council for Philosophical Inquiry with Children (ICPIC) to be held this week in Madrid (opening on Wednesday 28th and ending on Saturday 1st of July). Under the theme 'Philosophical Inquiry with Children Coming of Age: Family resemblances' the conference aims to offer "an open discussion covering all the different approaches to the implementation of the community of philosophical inquiry in formal, non-formal and informal education. [...] After nearly 50 years of engaging children, adolescents and adults in a community of philosophical inquiry in different (formal, non-formal and informal) educational settings, a wide variety of methods and styles have been used that share some common features and a family resemblance.". On Thursday morning, I will be presenting my paper "The Wonder Ponder Visual Philosophy for Children’s Independently Narrative but Thematically Connected Visuals as Stimuli for Philosophical Inquiry”, where I will explore the specific qualities of Wonder Ponder visual philosophy scenes in terms of how they operate to stimulate dialogue compared to other types of stimuli commonly used in philosophical practice with children, such as Lipman's philosophical novels or quality picture books chosen for their potential for philosophical inquiry. At the crossroads between philosophy, art and literature, Wonder Ponder boxes use thought-provoking visuals to encourage readers to explore philosophical issues (cruelty, identity and freedom in the three boxes published to date), aiming to foster independent, deep and playful thinking. Each box contains 14 striking, independently narrative but thematically connected scenes for thinking about and engaging in philosophical dialogue on a given issue. It also includes a further 3 blank scenes for readers to contribute to the book as authors and artists and, innovatively, as thought-provokers. I will suggest that, by virtue of being both deliberately philosophical and deliberately literary, the Wonder Ponder material interestingly incorporates advantages of other existing stimuli. Like Lipman’s philosophical novels, Wonder Ponder scenes and sets of scenes are designed with philosophical intention, even though the result is far closer to the picture book form than the novel form. The advantage of being able to design material with philosophical intention is that it allows you to purposefully pack the material with philosophically stimulating potential. I will explore the differences and similarities between engaging with text-based philosophical stimulus and image-based philosophical stimulus in these two cases. On the other hand, like picture books, Wonder Ponder scenes are designed and developed with literary intention. The advantage of creating material with literary intention is that it allows authors to bring out the deep connections between philosophy and literature in ways that are interestingly effective for stimulating philosophical inquiry with children. I will explore the differences and similarities between engaging with a picture book and one Wonder Ponder scene, and between a picture book and a full set of Wonder Ponder scenes, as a philosophical stimulus. In addition, the visual philosophy scenes in the Wonder Ponder boxes add one important advantage of their own in terms of thought and dialogue stimulation: the possibilities arising from comparing and contrasting. 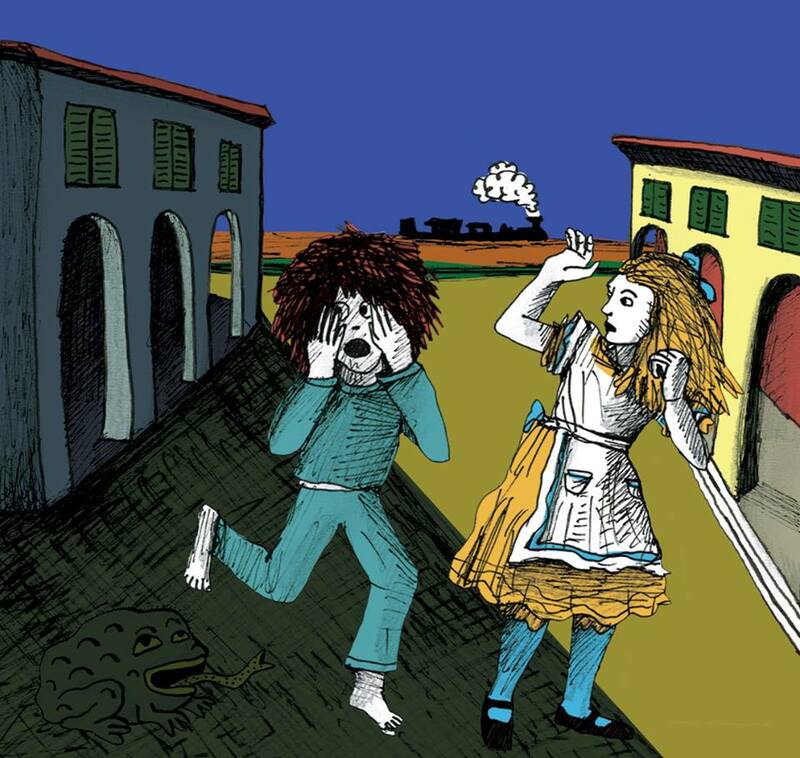 Although individually narrative scenes, the scenes included in a given Wonder Ponder box are designed to prompt questions and thinking by themselves, but also to prompt thinking through comparison and in conjunction with the other scenes in their box. Thus, each box tells 14 stories with connections, both literary and philosophical, incorporating an interesting and relatively unexplored territory within the range of stimuli for philosophical inquiry: the possibility of comparing and contrasting complex, yet easily and immediately grasped scenarios from an early age and making connections between different fields and issues. Besides presenting, I am also part of the Organizing Committee of the conference, which aims to be a fully bilingual conference (with sessions combining English and Spanish presentations and workshops), so our work's cut out for us! I'm very much looking forward to seeing some friends again and to meeting many others. I'm hoping -I'm sure- that this will be a stimulating opportunity to share and learn from each other. The conferences and some of the presentations and symposia will be broadcast live at https://www.youtube.com/c/RafaelRoblesLoro. Our Wonder Ponder titles (Cruelty Bites, I, Person and Whatever You Want will be available at the conference bookshop stall). Ellen Duthie, the author (together with illustrator Daniela Martagón) of the Wonder Ponder series of Visual Philosophy for Children, recently travelled to Argentina, Uruguay and Chile. In Argentina she was invited by the International Book Fair to give a conference addressing the educational community on asking and generating good questions in the classroom. Ellen gave several interviews during her trip. This one was for Argentina's Public TV, for the education programme Caminos de Tiza presented by Mirta Goldberg. Are there any subjects or issues that are inappropriate for children's literature to broach? Ellen answered this and other questions and spoke about Cruelty Bites, (Mundo cruel in Spanish). The video has subtitles in English. If they don't show up, please click on Subtitles, next to Settings in the lower right hand corner. Wonder Ponder has sold rights for the Visual Philosophy for Children titles to South Korea, Argentina, Brazil, Mexico, with other countries to follow shortly. In Argentina, Wonder Ponder has sold rights to ediciones iamiqué in Argentina for Cruelty Bites (Mundo cruel) and Whatever You Want (Lo que tú quieras). These titles are also distributed in Chile and Uruguay. A PLAYFULLY SERIOUS AND SERIOUSLY PLAYFUL INVITATION TO THINK ABOUT FREEDOM. Is being free doing whatever we want? Can we all do whatever we want at the same time? What is the difference between always having to do what you are told and being a slave? Are you anyone or anything's slave? Would being able to fly make you freer? Is it possible to be happy without being free? And what do we want to be free for? The third title in the Wonder Ponder Visual Philosophy for Children series, Whatever You Want, is an invitation to wonder and ponder about freedom for small, medium and large people. Half-way between a book and a game, Whatever You Want comes in a box and invites readers to think about freedom in a way that is both serious and seriously fun. Through the questions prompted by the scenes in the box, the reader-player can go building their own definition of freedom. Part of our critically acclaimed Wonder Ponder, Visual Philosophy for Children series, Whatever You Want is designed for children to look at, read and think playfully about by themselves, accompanied by an adult or in a group, in educational, play or family contexts. Christmas is around the corner and at Wonder Ponder we think it is a great chance for wonderpondering. Last year, we had the chance to see for ourselves that many teachers and families also thought so, judging by all the messages we got describing what a great time they had had and how much they had wonderpondered about Christmas with our special downloadable Christmas wonderpondering booklet. Would you like us to let you know when we have other material like this available? Thank you for your interest in Wonder Ponder! Are you ready to celebrate World Philosophy Day with our free downloadable thinking sheet? Are you ready to celebrate World Philosophy Day? 2. For those of you in Madrid (Spain) only: A Visual Philosophy Recital (in Spanish). What's that? You ask. You'll just have to hope we do one soon somewhere near you to find out! Second, (only for people in Madrid), this Saturday we are performing a Visual Philosophy Recital as part of the World Philosophy Day activities organised by MásFilosofía. It will take place at the Centro Cultural La Corrala, at Calle Carlos Arniches. The recital invites children and their families (as well as adults without a child chaperone to come with us on a journey through some of the scenes in Wonder Ponder's book-in-a-box games, while listening to a vibrant, fun and thought-provoking recital. For Wonder Ponder, World Philosophy Day not only celebrates philosophy, it also marks our second anniversary of the launch of our first title Cruelty Bites in November 2014. Today, it has been published in South Korea and Argentina and rights have been sold to Turkey, South Korea and Mexico. We have just today received the third edition of the Spanish version, Mundo cruel, and the Catalan editions of our first two titles, Cruelty Bites and I, Person. A copy of Whatever You Want, of our Visual Philosophy for Children book-in-a-box, specially signed and dedicated by the authors, with a drawing by the illustrator, Daniela Martagón? We'll send it wherever you tell us to! Whatever You Want is an invitation to wonder and ponder about freedom for small, medium and large people. Half-way between a book and a game, it comes in a box and invites readers to think about freedom in a way that is both serious and seriously fun. Through the questions prompted by the scenes in the box, the reader-player can go building their own definition of freedom. Part of our critically acclaimed Wonder Ponder, Visual Philosophy for Children series, Whatever You Want is designed for children to look at, read and think playfully about by themselves, accompanied by an adult or in a group, in educational, play or family contexts. It's easy! 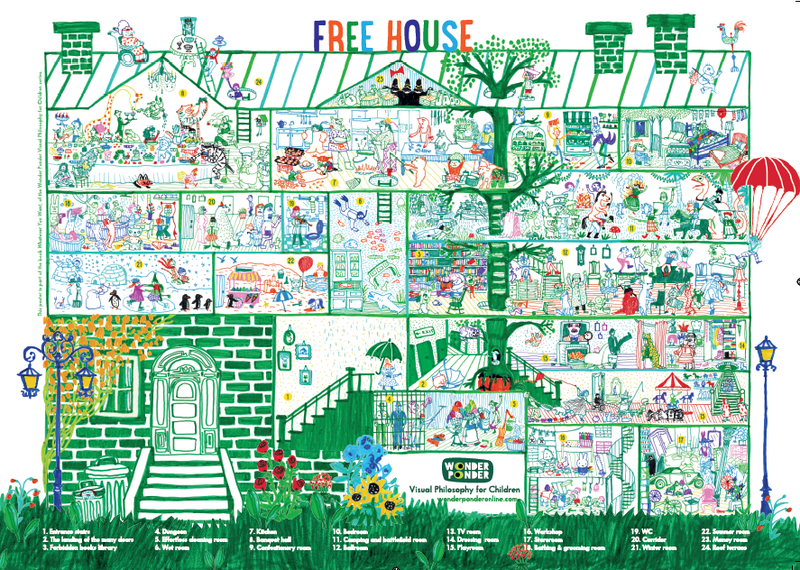 Look carefully at all the inhabitants of the Free House (the poster from Whatever You Want) and find at least 10 references to characters from children's literature (you'll see it's chock-a-block!). When you've spotted ten characters, go to our Facebook page and leave a comment on this post, indicating your 10 characters, with the titles of the books they appear, the authors of the books and the room in the Free House where you found them (at the bottom of the poster you'll see a numbered list of all the rooms and spaces inside the house). Remember! Your answer should be the list of the 10 characters you've found, with corresponding titles, authors and location within the house, and you should send us your answer as a comment on our Facebook page. The draw from among all correct answers will take place on Friday 28th of October 2016. Good luck! Need some tips? The poster features characters from Jumanji, by Chris Van Allsburg, from The Tiger Who Came to Tea by Judith Kerr, In the Night Kitchen by Maurice Sendak, I Want My Hat Back, by Jon Klassen, from Conrad, the Factory-made Boy, by Christine Nostlinger, from Where the Wild Things Are by Maurice Sendak... and from many, many, many more books. Enjoy! What was the prize again? In the workshops with teachers, librarians and facilitators offered by Wonder Ponder, some of the concerns most often voiced are to do with participation in the dynamics of philosophical dialogue in the classroom or in non-formal educational contexts. Could philosophical dialogue be exclusionary to students with social anxiety and communication difficulties or who are simply more introverted than others? What can be done to ensure that children who find it difficult to participate are not left out? How do you integrate in the community of enquiry people who don't feel at ease speaking in front of others or who find it intimidating to expose their views or who have difficulties communicating or who would simply rather not speak in that context? Obviously there is no magic strategy to ensure that all members of the community participate equally. It will depend on the child in question, the specific group, the context, the group's familiarity with philosophical dialogue and the person acting as facilitator of the dialogue. However, in this blog post our author Ellen Duthie shares three cases that helped her rethink participation and ease the pressure -on the kids and on herself-. I don't have a magic strategy, no, but I do have three cases that have helped me think about this issue. Here are three pointers, one related to each of the cases, which I find useful to take into account when thinking about participation. There's this ten-year-old boy who has been coming to every single one of the workshops I've done in Madrid for the last four years or so. He hasn't missed a single one. He insists to his parents he wants to attend. He is very chatty when one's alone with him, and when he is playing with his friends. He is articulate, has a broad vocabulary and is able to express complex ideas and to resolve conflicts during play. And yet, he hardly opens his mouth at the workshops. He may have uttered all of two sentences in all the dialogues of all the workshops put together. When his mother asks me whether he has participated I say he has. I say that although he has not spoken out loud during the dialogue, he has been following everything everyone has been saying very attentively and with interest, smiling and reacting to what his fellow enquirers say. The mother tells me that later, when they get home, he tells her in great detail about everything that was said, who argued what, replaying the dialogue at home with her. This time he does participate orally, expressing his agreement or disagreement with the different arguments he has listened to in the morning, and he goes building an answer of his own. Some children -and some adults- have a quick pace of thinking, while others prefer a slower pace. They like letting what they read and what they hear sink in, digesting it, and then speaking about it calmly, perhaps one-on-one with a friend, a mother or a father. Some people don't find it hard to go building their answers during the dialogue, rectifying and adjusting on the go. But others prefer or even need to think it over for a bit longer, to have that dialogue internally before making any utterance. This internal dialogue can also be part of the shared dialogue. It can be a form -an active form even- of participation. A girl who came to a series of weekly workshops did not open her mouth once the first two weeks. Her parents had 'warned' me of her intense shyness and said she might find it hard. The third week, mid workshop, she suddenly started talking. It was as if she had suddenly clicked that this was slightly different from what she had expected: here, unlike some other contexts, she did feel like participating. This is by no means the only time this has happened. I think it has something to do with the pace of thinking and arguing in philosophical dialogue. In other contexts, inside and outside the classroom, people with social anxiety or difficulties to communicate can feel uncomfortable and pressured when asked questions. Most questions we are asked seem to requiere a quick answer (either in the form of the correct answer or in the form of a formed opinion). But precisely in philosophical dialogue the pace is slower. It is not about getting rid of the question by solving it, 'shooting it down' as it were, with an answer. In philosophical dialogue questions are dealt with carefully, attentively, in as orderly a fashion as possible. It's not about getting rid of it but about staying with it for long enough to understand it better, getting comfortable with it, learning to see it from all possible angles. This unhurried pace can be comforting precisely for people who may feel intensely unconfortable and reluctant to participating in other contexts. 3. Consider different ways of participating. There is another boy who has come to many of my workshops and who many might label as non-participative. He is quite similar in attitude to the boy in case number 1, what you might call a silent thinker. But what is interesting is how his attitude changes during the art work we often do after the dialogues at Wonder Ponder workshops. Here he transforms and becomes energetic, creative and delightfully spontaneous. This does not mean he doesn't enjoy the dialogues in silence. But I always pay special attention to his artistic contributions because they are fantastic (they are), but also to make him see that one kind of participation is not more important than the other and that I understand perfectly and see in his drawings all the work he has done in silence during the dialogue. Even during the dialogue I try to incorporate different forms of participation. For instance, there are certain introductory, warm-up questions that invite sharing an experience of one's own that might have bearing on the issue we are about to explore. For some, participating in this kind of question is less intimidating than participating in more purely philosophical questions. And the other way around. Some would rather not share any personal experiences and focus on the issues themselves. In this sense, I try to pay attention and ask each of the members of the group the kind of questions I know they are more comfortable with and find more fun to answer. By making them feel at ease, with no pressure, they often do eventually and gradually start participating in ways other than those they were most comfortable at the beginning and start stepping out of their comfort zone. I think the main thing is creating a pleasant, stimulating and safe space for dialogue. And making sure there is no rush. No pressure. No forcing anyone. Giving time. And paying attention to the different ways of enjoying that time where we stop and think together. The titles in the series: Cruelty Bites, I, Person, Whatever You Want and Pinch Me! Ellen Duthie's blogs: Story Philosophy, Filosofía a la de tres (in Spanish), We Read it Like This. At the launch of the third title in our Visual Philosophy for Children series, Whatever You Want (an invitation to wonder and ponder about freedom), Wonder Ponder illustrator, designer and co-author Daniela Martagón told the audience about the creative process from her point of view. She focused on the fascinating search for the right tone. This 'first dummy' was shown to a group of children of different ages (5 to 12) in the form of an exhibition during a series of workshops. And it worked very well. It contained powerful scenes that led to very interesting reactions and dialogues but after working with the scenes, we felt that as a whole the concept was rather fatalistic and oppressive. We felt we needed an approach that would allow room for freer or more liberating examples. The second attempt was tied to the working title we had for the box in English: Freedom in a Box. We loved the title and we also liked the possibility of finding freedom in confinement represented by the image, but we could not find a way of translating it into Spanish that sounded good. The literal translation "La libertad en caja" created an involuntary pun with "en caja" (in a box) and "encaja" (to fit in) that did not make us happy. We didn't want to have titles in Spanish and English that were too dissimilar from a conceptual point of view, so we looked for another title. After finding one we were happy with in both languages (Whatever You Want / Lo que tú quieras), we continued to experiment with the idea of freedom in confinement, again playing with cages. But here we found again and again, that the meaning of the title and the meaning of the image clashed. It just wasn't working. We were starting to feel imprisoned by our own cage idea. We removed the cage and tried with a gag and rope. But it still wasn't clear. Some people even pointed to possible innuendos we had never even thought of (really!). And then came a second phase, where I veered to the other extreme: life with no supervision or rules of any kind. Children playing with fire. A power-intoxicated baby. Driving, smoking. But we didn't like the moralistic tone of it, whereby if children are given freedom, they don't know how to handle it. That was not the route we wanted to follow either. I decided to keep the baby, but I swapped the unchecked will for desire. I tried with the idea of a genie. It wasn't bad, we like it. We were almost there... But we felt the cover elicited only the desire aspect of freedom, when inside, the book was about so much more. Still not quite convincing. And then I drew this girl in full, ecstatic explosion of freedom. Free! We liked the celebratory feel of it. I continued to try it out, until I hit upon the idea of a loudspeaker. Here, not only is she in full ectasy of freedom, but she is also asking us readers to join her. We felt we had reached the end of our fascinating journey from fatalism to celebration. This was it! A few changes, a bit of colour. and voilà! All the illustrations from this post by Daniela Martagón.